Portable, durable and sturdy whiteboard is here! Double sided surface doubles the space you write on.Magnetic surface can hold messages, calendars, notes, and memos for any occasion. 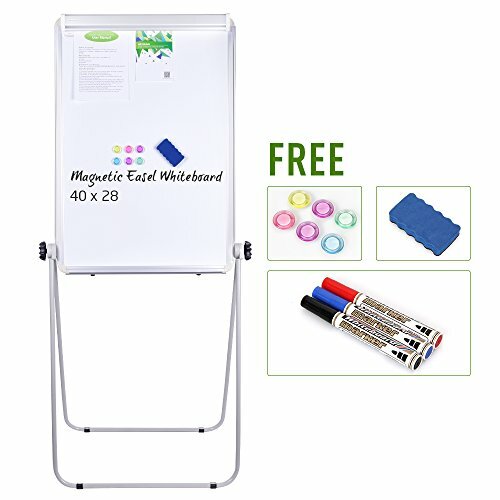 Whether used in school, homeschooling, or the office, this is the perfect sized, quality whiteboard for you! Please peel off the protective film for the writing surface before use. For your convenience, we've already cut along the board frame for easy tear. Simply use your thumb or a knife to tear the film slightly from the board corner and then take off the film step by step. The double sided whiteboard is made of medium density fiberboard (MDF), aluminum frame, ABS corner and Iron pipes. The back of galvanized steel sheet increases the magnetism for holding paper or memos compared to ordinary magnetic boards. WEYOUNG easel board is perfect for home, offices, schools, coffee shops, restaurants, stadiums or any other places. Designed for office presentation, home/school teaching, outdoor activities, etc., make your next presentation a memorable one! Simply use any board magnets (6 magnets included) to pin all of your notes, messages, pictures, memos, calendars, menus and reminders etc. on the magnetic whiteboard. Or you can hang presentation materials with the elastic clip or flipchart hooks on the top of the board. To ensure that the whiteboard is shipped and handled without damage, it is shipped in a reinforced box in a cardboard and polystyrene (foam) padding to secure the board safely. WEYOUNG offers lifetime warranty for our magnetic whiteboard, ensuring NO RISK order for you! Add to cart today. DOUBLE-SIDED MAGNETIC WRITING SURFACE: 40x28 inches whiteboard is beautifully finished with double-sided smooth and durable writing surface. Works with all dry-erase markers, and never worry about stains after wiping with dry-wipe eraser in time. ADJUSTABLE HEIGHT & 360 DEGREE ROTATING: The height can be easily adjusted from 40.5 to 75 inches. Whether children or adults, seating or standing, you can write or view in your most optimum angles. 360 degree rotating design allows you to turn the dry erase board to a landscape position to write or view just like you would on your office desk or table at home! PREMIUM CONSTRUCTION & STAND FIRMLY: WEYOUNG portable whiteboard is constructed with anodized & scratch resistant aluminum frames, which provides incredible durability to our quality whiteboard. Built-in U-stand with anti-slip reinforced corners makes the board sturdy enough to stay in place when you are writing. Never worry about messing up your notes or memos again and try our premium whiteboard experience. USER FRIENDLY: Lightweight and easy to carry, our design is not only high quality but designed for comfort for daily use for projects in any places. Included are: flipchart hooks, elastic clip and marker tray, so that you can hang presentation materials on its flipchart hooks or paper clip and place dry-erase markers or erasers on the marker tray. LIFETIME WARRANTY: If you are not 100% satisfied with WEYOUNG double sided whiteboard, please contact us without hesitation. Our hassle-free customer service team will guarantee you are satisfied with your purchase and assist you with any problems. If you have any questions about this product by WEYOUNG, contact us by completing and submitting the form below. If you are looking for a specif part number, please include it with your message.